What do I wish to ask you? Not to exist? Never to have existed? To return to my mind and stay there? For I fear I may have conjured you from my febrile imaginings. I thought that you were locked up safely in my mind. I thought that in this actual, tangible world, women were just as women are. Which is to say, loud strumpets in foul taverns; dull ladies in fine houses; vain damsels waiting on the Queen. Or serving-wrenches, or dairy-maids, or worldly widows...the common run of women in their place, with the qualities that place prescribes. But what are you? A scholar or a mistress? A temptress or a wife? An angel or a witch? I cannot say. And, as I cannot, I don't know what I want to ask. This is a fervent time, and I must remember it. I must keep it with me. I am writing notes on what we do, and how we love, all of them in Hebrew, which I know Hunsdon can never read. It is a sad fact of our lives that it is easier to convey pain and sorrow than pleasure and happiness--I trust that in the afterlife we shall find perfection more to our liking. This is a passion that transforms me, and a love that makes the world glitter. Goodbye, Will. This is your world, your "stage". These are your people. Make your riddles, strut your words--none of this can interest me. A TALE OF SORCERY AND PASSION IN SEVENTEENTH-CENTURY LONDON—WHERE WITCHES HAUNT WILLIAM SHAKESPEARE AND HIS DARK LADY, THE PLAYWRIGHT'S MUSE AND ONE TRUE LOVE. The daughter of a Venetian musician, Aemilia Bassano came of age in Queen Elizabeth’s royal court. The Queen’s favorite, she develops a love of poetry and learning, maturing into a young woman known not only for her beauty but also her sharp mind and quick tongue. Aemilia becomes the mistress of Lord Hunsdon, but her position is precarious. Then she crosses paths with an impetuous playwright named William Shakespeare and begins an impassioned but ill-fated affair. A decade later, the Queen is dead, and Aemilia Bassano is now Aemilia Lanyer, fallen from favor and married to a fool. Like the rest of London, she fears the plague. And when her young son Henry takes ill, Aemilia resolves to do anything to save him, even if it means seeking help from her estranged lover, Will—or worse, making a pact with the Devil himself. In rich, vivid detail, Sally O’Reilly breathes life into England’s first female poet, a mysterious woman nearly forgotten by history. Full of passion and devilish schemes, Dark Aemilia is a tale worthy of the Bard. Selected by O, The Oprah Magazine as one of 17 Books You Won't Be Able To Put Down! Ahhh the beautiful language of this historical fiction book, I can't describe how eloquently this author puts words on a page. This is a book that must be experienced to fully understand it's magnificence. 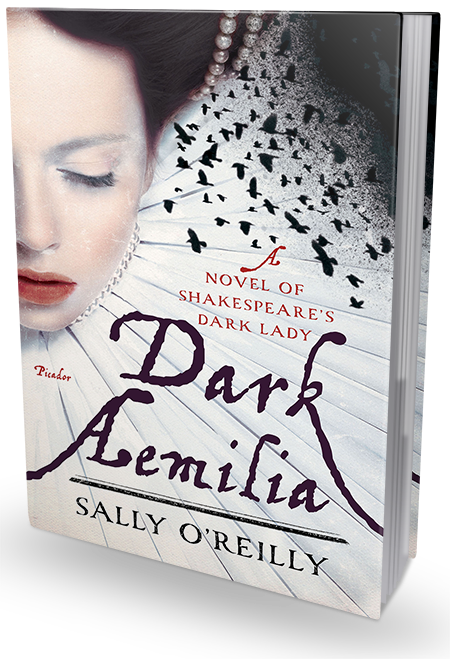 Dark Aemilia is a fictional account of the life of Aemilia Lanyer, one of several women whose names have been suggested as possible candidates for the 'Dark Lady' of Shakespeare's sonnets. She was also one of the first women in England to have a book of poetry published. Born Aemilia Bassano, the illegitimate daughter of a Venetian musician at the court of Elizabeth I, Aemilia becomes the mistress of the much older nobleman Lord Hunsdon. When she discovers that she is pregnant, she is forced to leave court and is married off to another court musician, Alfonso Lanyer. However, the father of her child (according to Sally O'Reilly) is probably not Hunsdon, but a young playwright by the name of William Shakespeare. Aemilia and Shakespeare first meet at a performance of his play "Taming of the Shrew." She is appalled by the way Will makes the woman out to be a cast off in this play and she isn't afraid to tell him so. The two first start corresponding in poetic letters but soon begin a love affair. It is a love affair so heart stopping and so well wrote that I felt transported to Elizabethan times. The language was at times vulgar but never not true to the language of the time. I feel the author portrayed the love and the language perfectly that the reader was able to imagine the scenes perfectly as if they themselves were there. I adore writers that are able to do this! The character of Aemilia was written well and one cannot help themselves but to feel for this woman. I this Sally O'Reilly does a great job portraying this complex and sometimes provocative character. Aemilia is a heroine whose passionate, fiery nature and drive is so courageous that she faces such dark times headlong with admirable will to go on. I find myself compelled to know more about this woman and the Elizabethan times. One of the many things I found enchanting about this tale, was the fact that it wasn't difficult to read and digest for the average person. Personally, I shy away from poetry and books that take place in long ago eras, because the language is usually old world English. I did not have this problem at all with this book and I can't wait to pick up more of this writers books. Sally O'Reilly has received numerous citations for her fiction, which has been shortlisted for the Ian St James Short Story Prize and the Cosmopolitan Short Story Award. A former Cosmopolitan New Journalist of the Year, her work has appeared in The Guardian, The Sunday Times, the Evening Standard, and the New Scientist. She teaches creative writing at the Open University and the University of Portsmouth in England. Dark Aemilia is her U.S. debut. For information and news please visit Sally O'Reilly's website and the Dark Aemilia Facebook Page. Sunday, September 28 Review at WTF Are You Reading?